Please excuse the bad photo! 1. 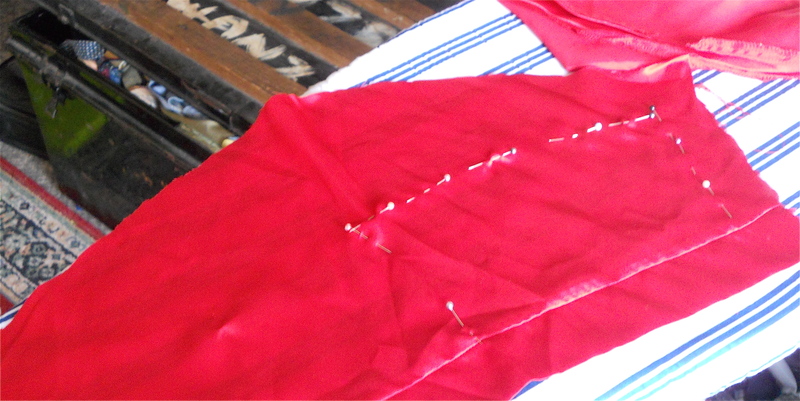 Trim the overlocking from the sleeves we cut off the robe yesterday. 2. 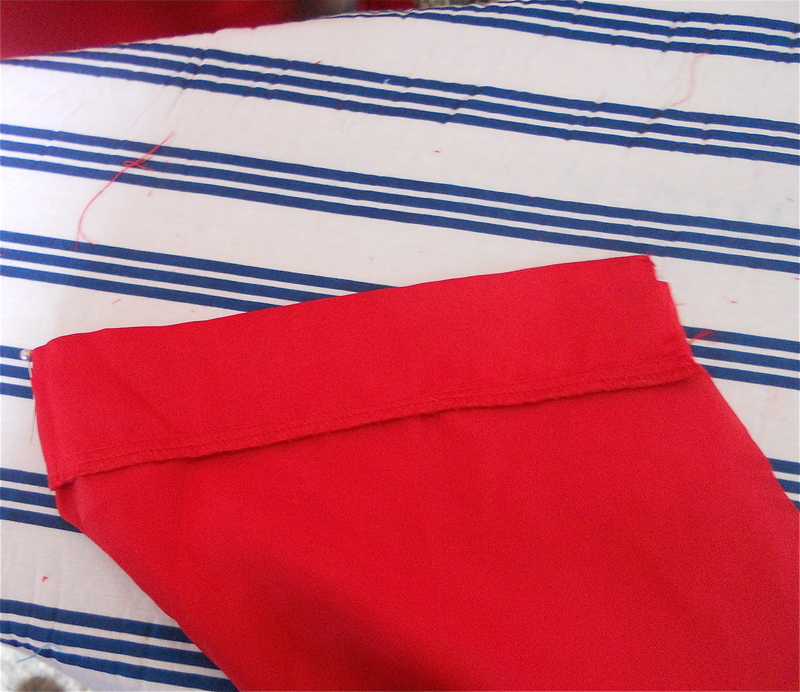 With one sleeve fold in half with hem edges together and press. 3. Open the sleeve back up and mark with a pin. Preferably a straight one! 4. Find the centre back of the robe neckline, and line up the centres. 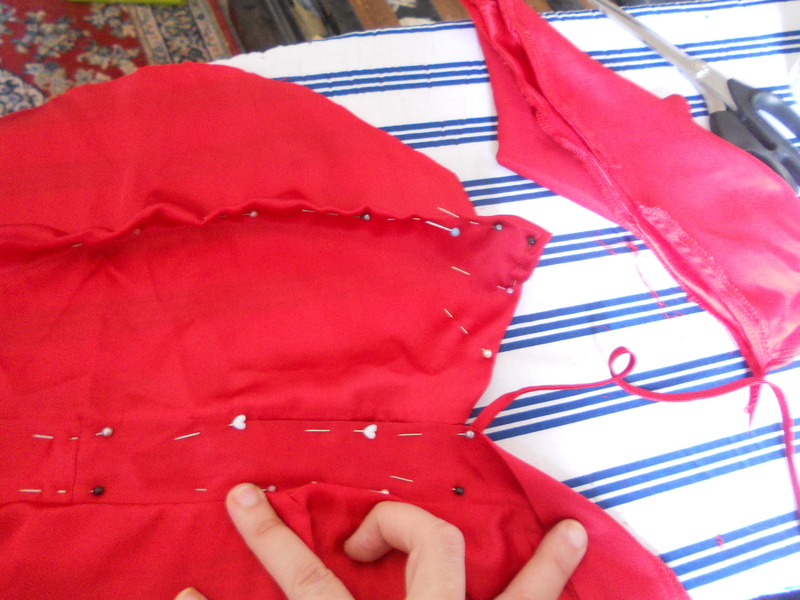 Just tuck the sleeve piece behind the finished neck edge of the cape. 5. 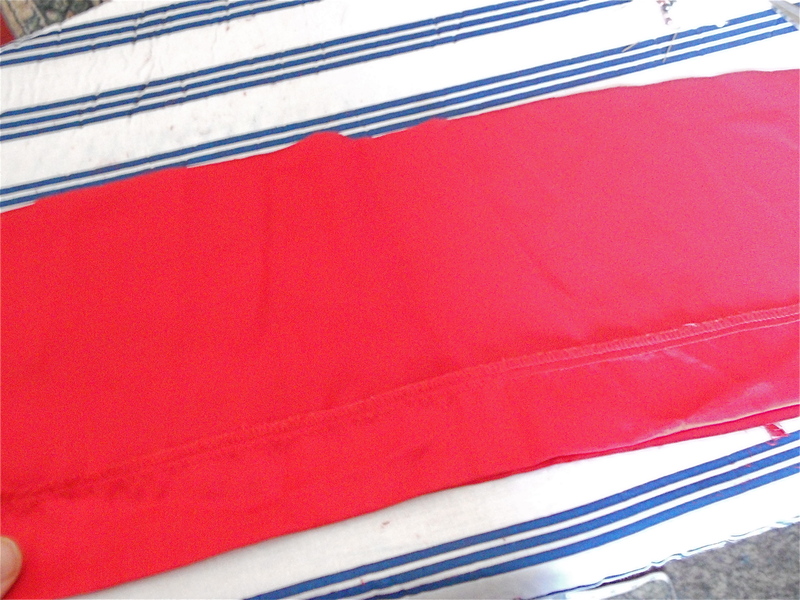 Pin (top and bottom edge) all the way around the neck edge lining up the hem of the sleeve piece and the inside edge of the cape. 6. 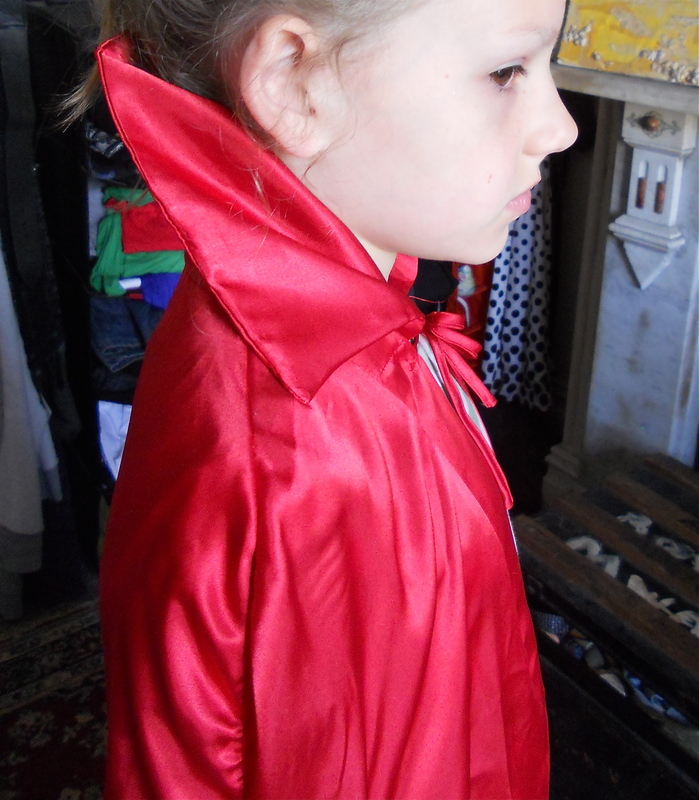 Put cape on anyone who won't run away, and using pins, shape the sleeve piece to the desired collar shape. From now on I will call this piece a collar. 7. Check to see that you are happy with the shape, and get it roughly the same on both sides. Don't over panic this step as we will even it up later. It is best if the collar doesn't extend past the ties. 8. Take cape off. 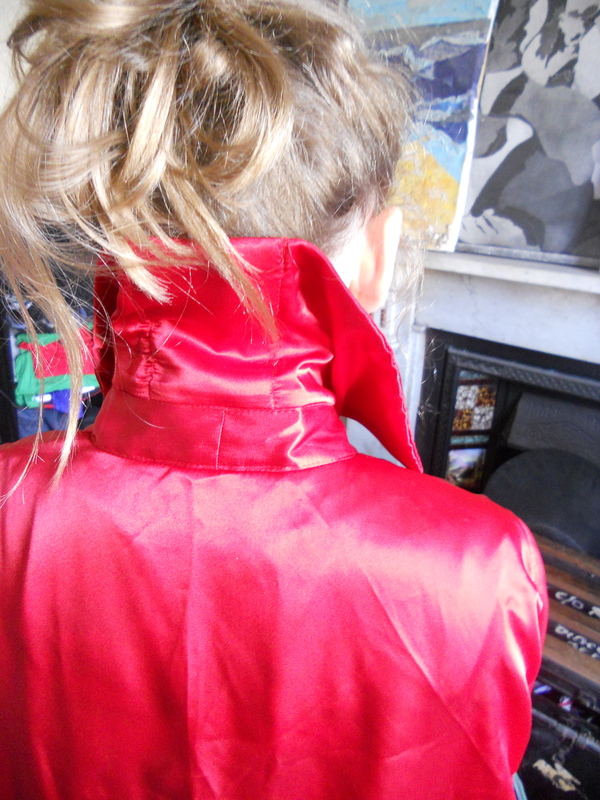 Unpin collar from cape. 9. 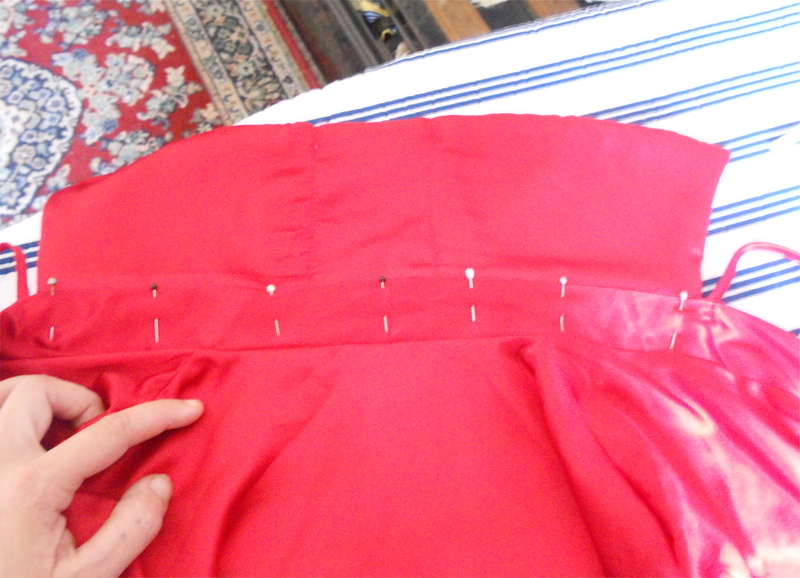 Take out pins and replace them, one-at-a-time, along the edge of the shape you want. Just do this for half of the collar. 10. Keeping the centre of the top and bottom collar marked, flatted collar back out, and check the shape again. 11. 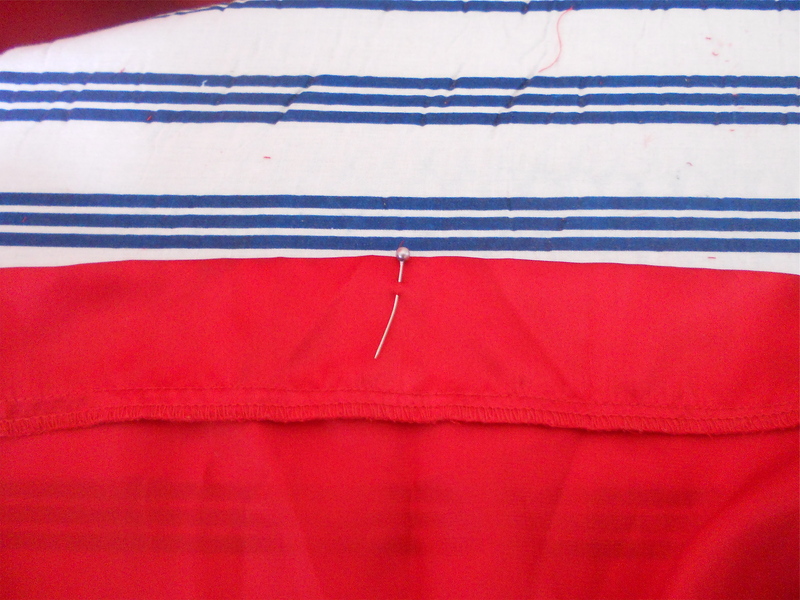 Keeping the unpinned edges together, fold in half at centre pins. 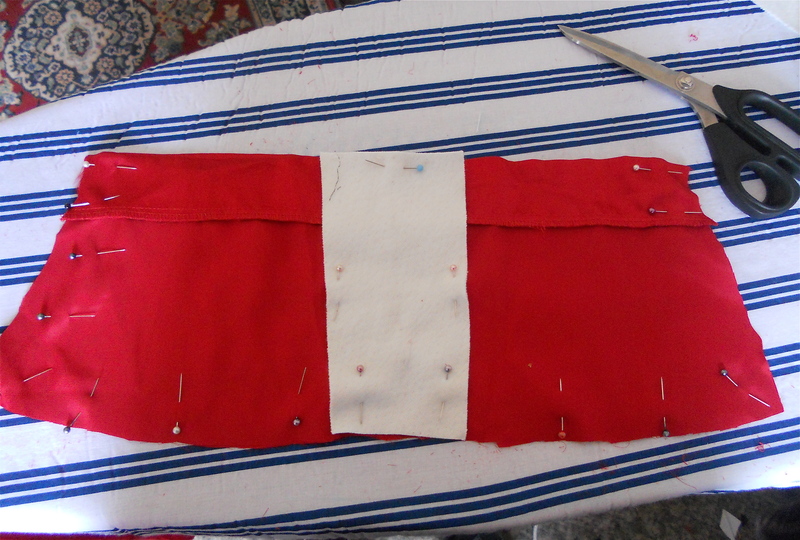 Pin through both layers of fabric and cut. 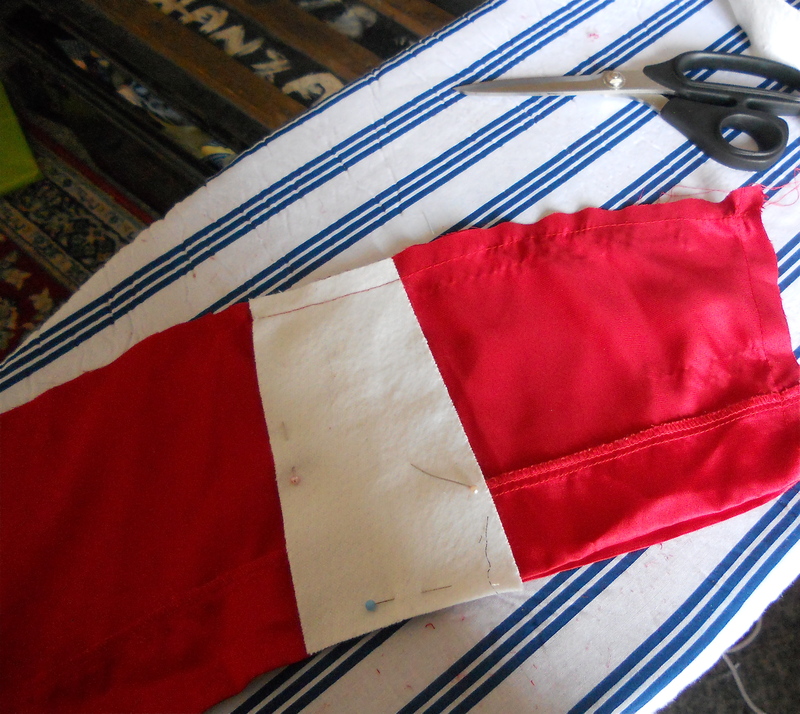 Remember to add seam allowance. About 1cm is good. 12. 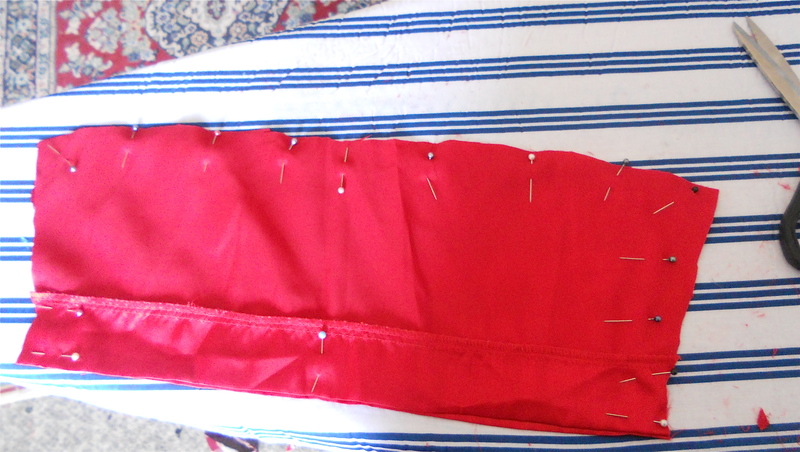 Take out all the pins and lay flat. 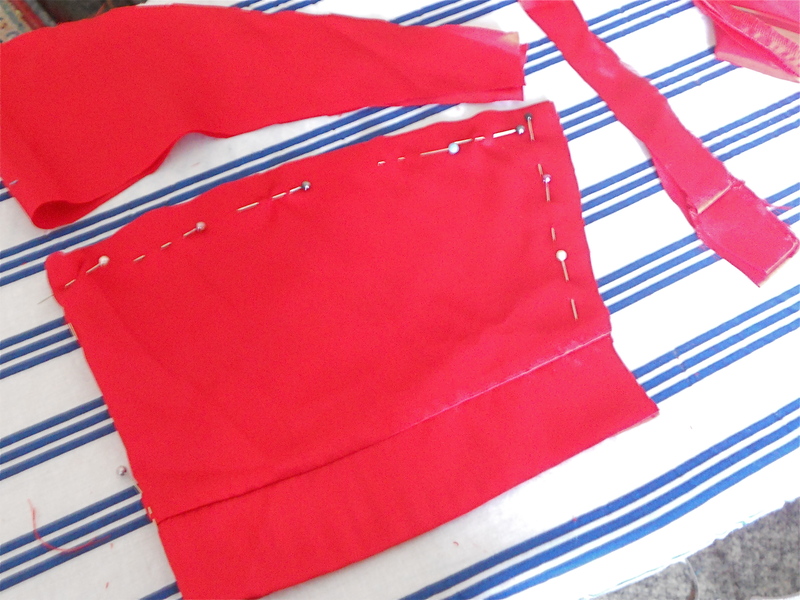 Get the other sleeve, put right sides of the sleeves/collar together and cut a second shape from the other sleeve exactly the same shape. 12. 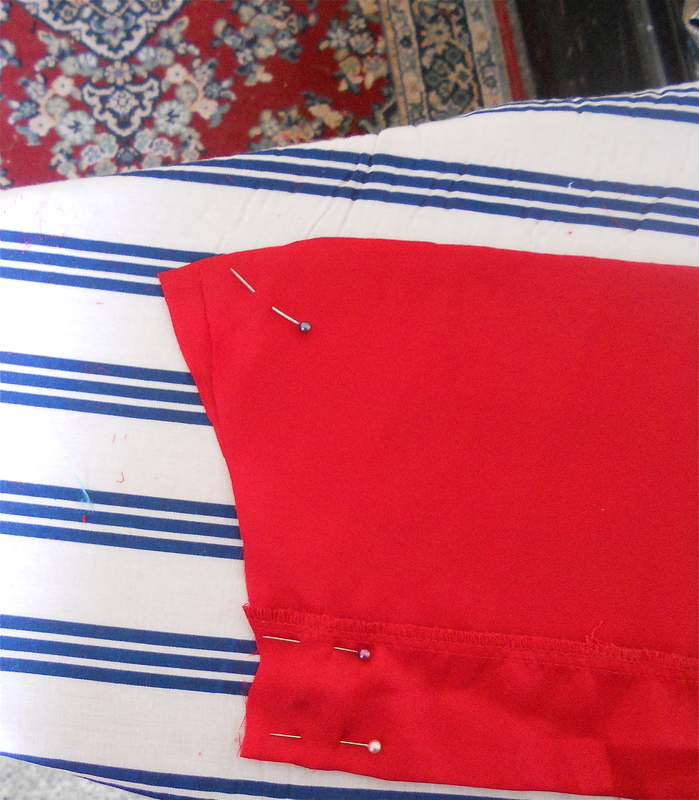 Pin sleeves together. 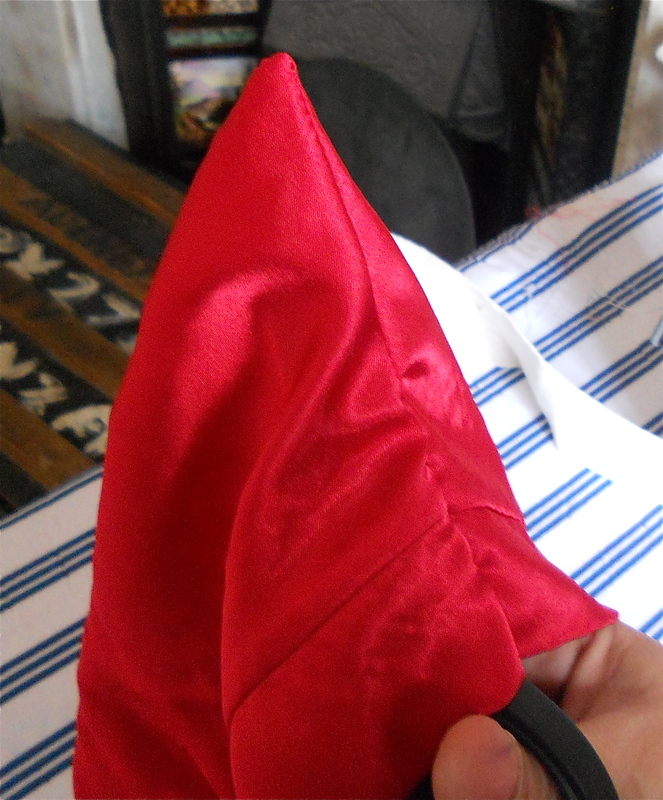 If you are using slippery fabric like I did, your edges may not exactly match.... Just trim them so they are the same. 13. 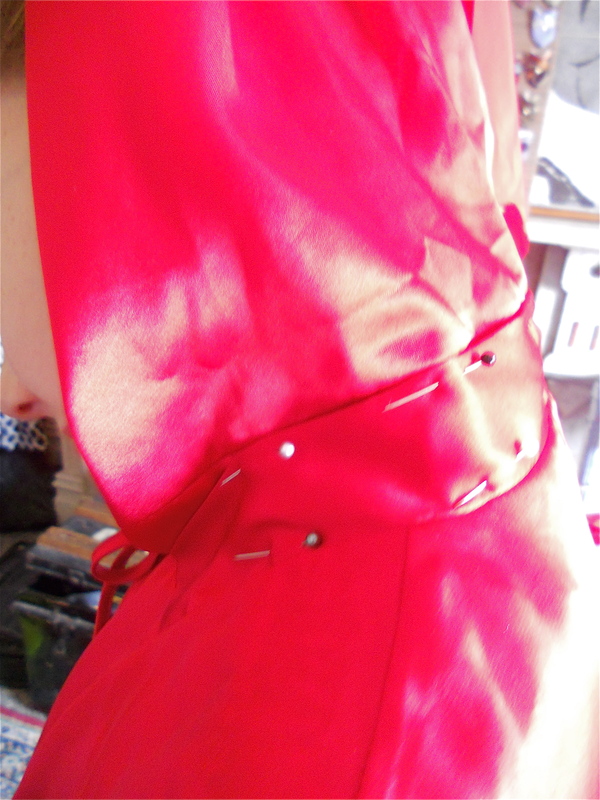 Pin all around the collar leaving the hemmed edge unpinned. You should still have a pin marking the centre back. Leave this in. You will need it later. 13a (optional) I added a little strip of felt to the inside of the back collar to give it some body. 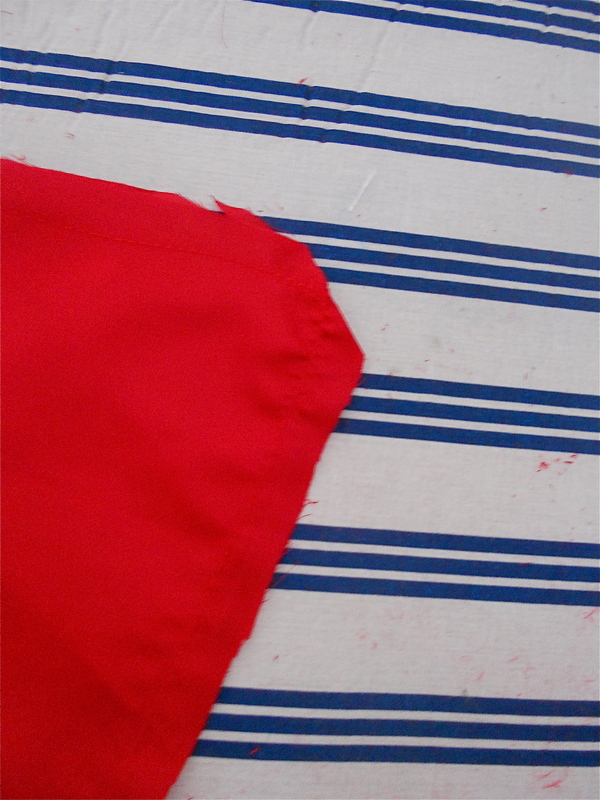 If you wanted a very stiff collar this would be the time to add very stiff interfacing the same shape as the collar, or boning strips at about 5 regular intervals along the collar. 14. 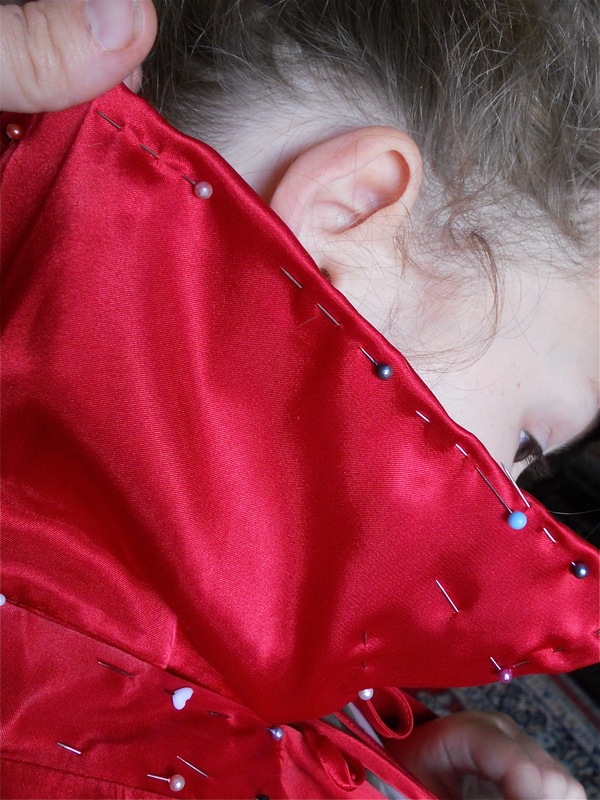 Sew around the pinned edge of the collar (and through the felt if you used it. 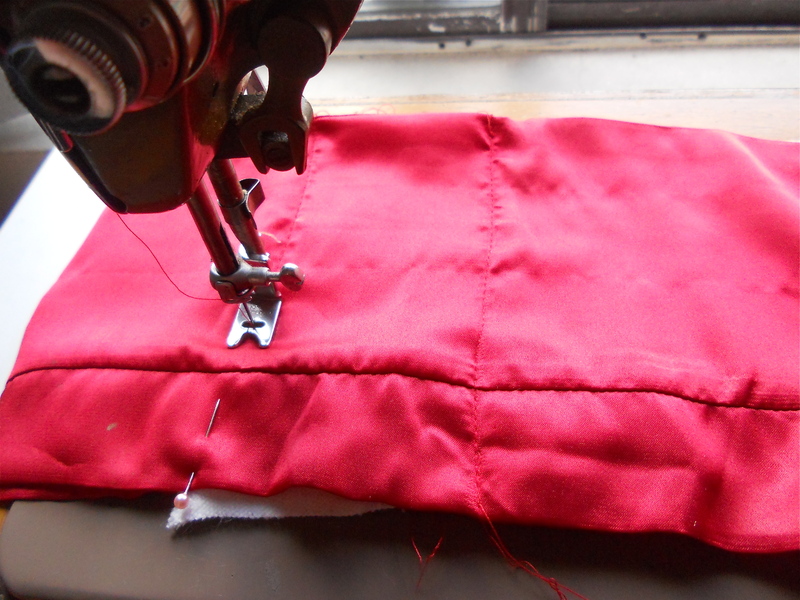 Leave hemmed edge open. 15. 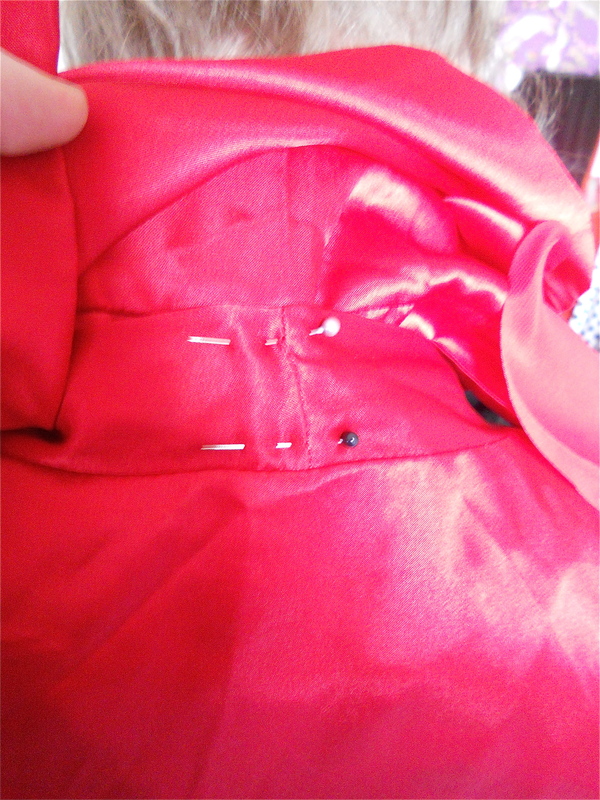 Clip across the corners of the collar, being very careful not to cut your stitching. 15. Turn the collar to the right side (the side you want to see). 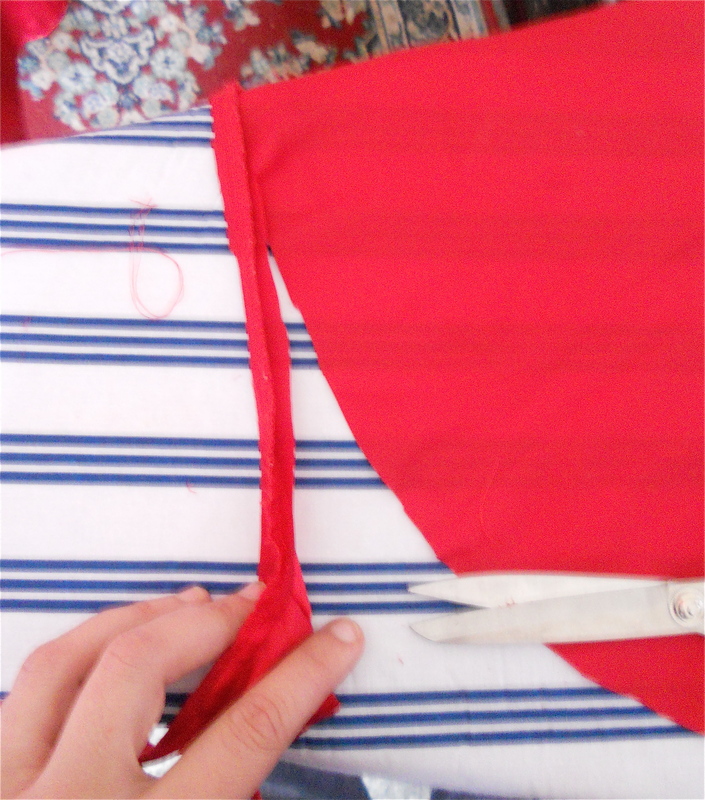 Use closed scissors to gently push out the corners. 16. It should now look something like this. Give it a good press. 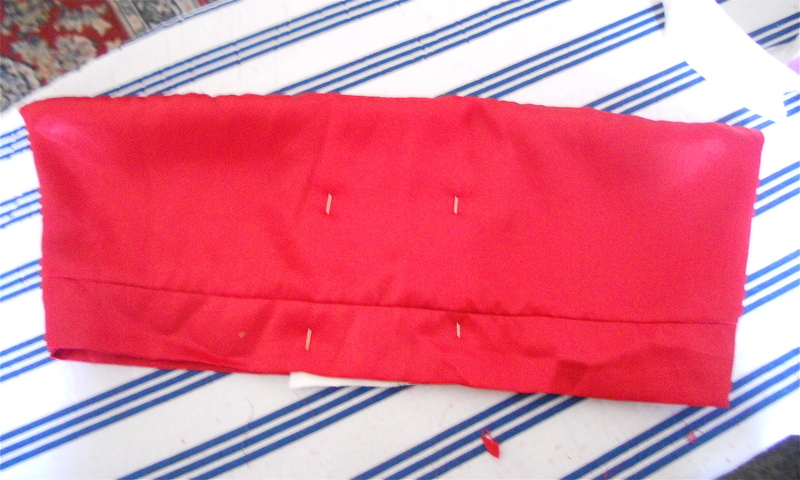 16a( optional) Remove pins from the inside holding down the felt. 16b. 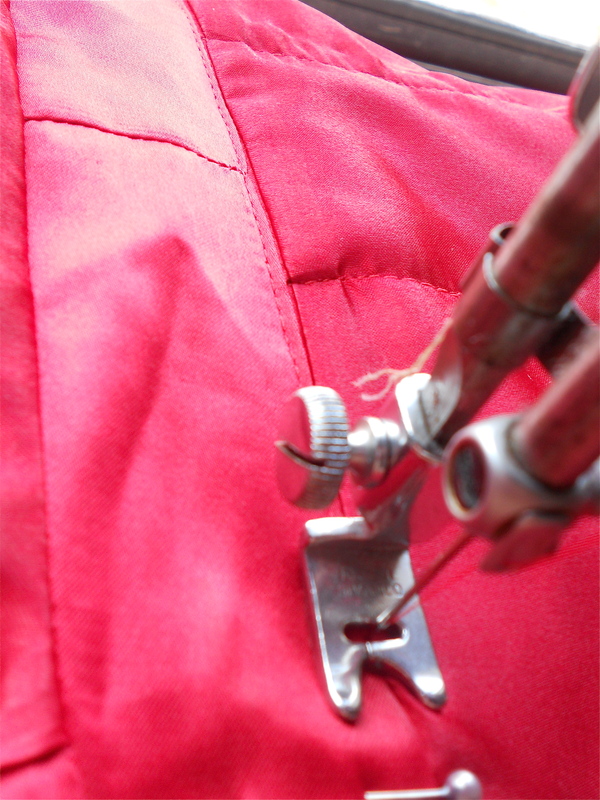 (optional) Stitch through all layers of the collar to secure the felt. 17. Put the collar on. 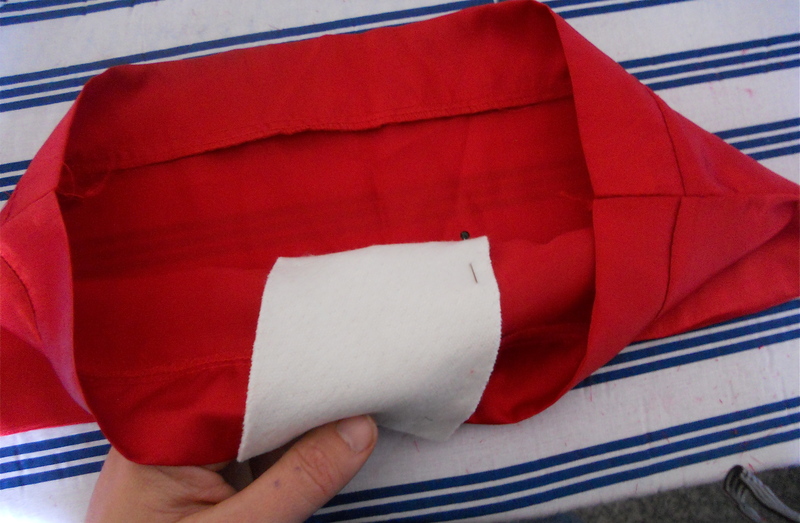 Pin the hemmed edge flat underneath the finished collar edge. (You are going to have a slightly unfinished edge on the inside... but girls!... 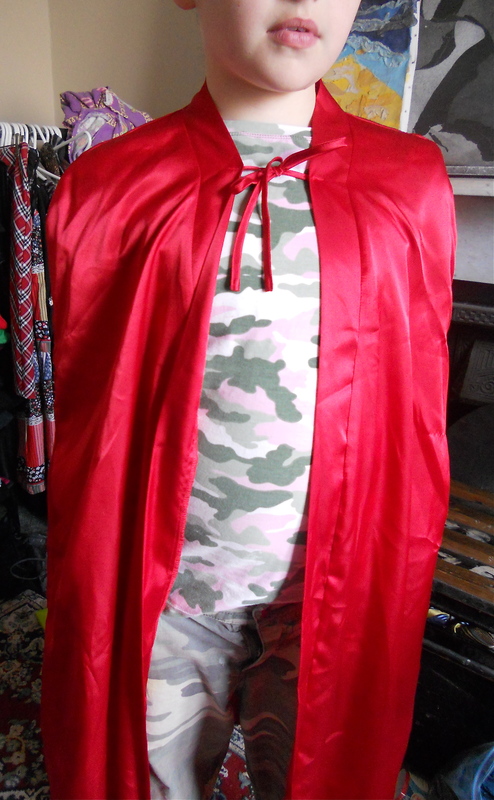 it's a costume) Make sure it is in the middle. 18. 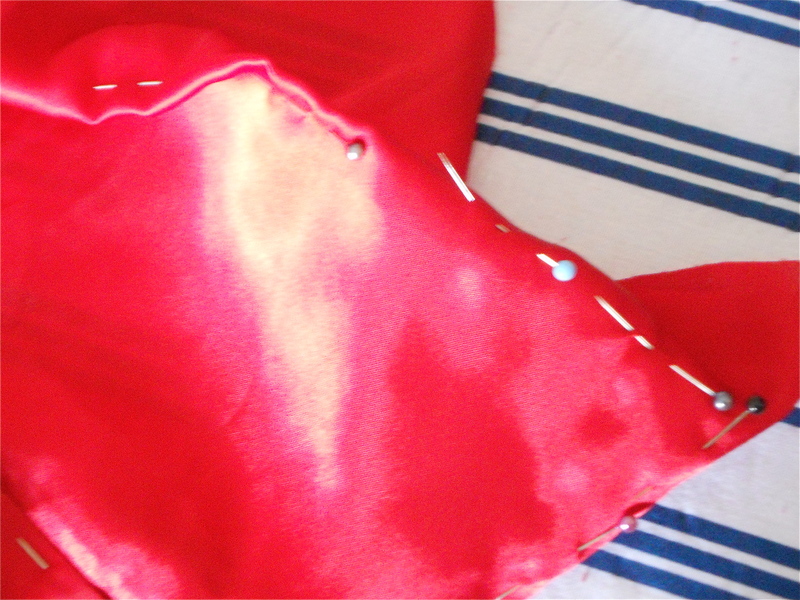 Stitch through all layers about 2mm from the seam on the cape. 18. Presto! 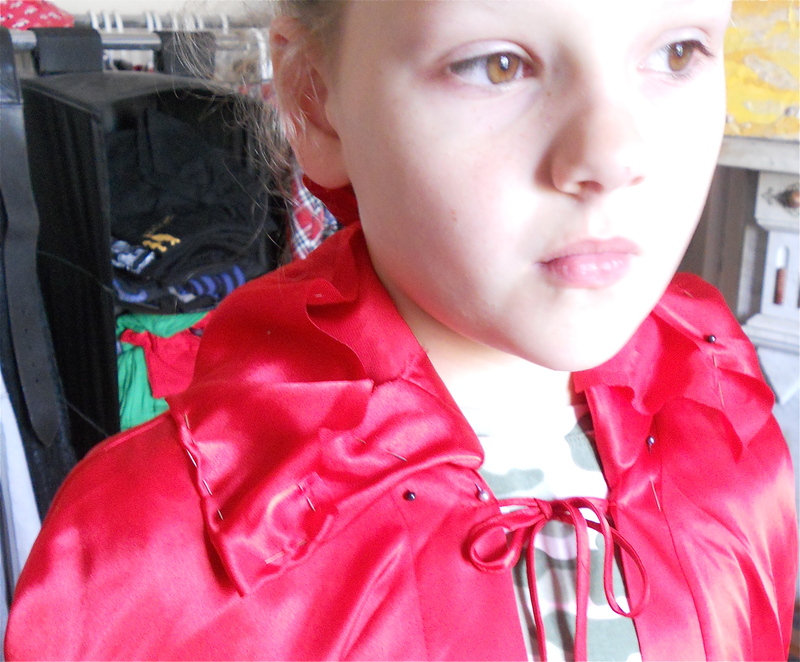 An upcycled collared cape. My poor model was home sick from school the day I made this tutorial and took all the photos. She is normally very cheery! Thanks 10 year old.